The engine’s cooling system is one of the essential features of a vehicle. The purpose of the cooling system is to keep an engine running at optimal temperatures. The radiator is responsible for cooling down the antifreeze/coolant that runs through a vehicle’s motor. If a radiator fails, it could result in engine failure. It is because the motor will overheat from the friction of the movable parts. A radiator is made up of small fins and tubes that run through it. The coolant flows through the tubes, and the heat escapes through the fins. A radiator inspection can indicate if there is any damage to the exterior of the radiator or if there are any leaks. The most common radiator problem experienced is leaking. Leaks can occur if there is any damage done to the fins or tubes of the radiator. Leaks can occur when you do not have enough fluid circulating through the system, which will lead to an engine overheating. If a radiator fails ultimately it won’t cool down the fluid and only will be recycling hot solutions through your engine block. One sign your radiator might not be operating accurately is if your temp gauge keeps rising. Apparently, other problems could contribute to your engine’s temperature to continue rising such as a bad thermostat. But if the radiator is leaking or spraying fluid, it is a sure fire sign that it needs to be replaced. Radiator repair or replacement is vital to keep your engine’s cooling system working properly. Is there anything you can do to prolong the life of your radiator? The first thing you can do is make sure your fluid levels are correct. The next is to consider having an engine coolant flush. A coolant flush will eliminate any debris that might be flowing through the cooling system. Sludge is also possible if oil gets mixed with coolant or if dirt gets into the system. If your vehicle is overheating or you notice a leak in the radiator, don’t wait to get it replaced. 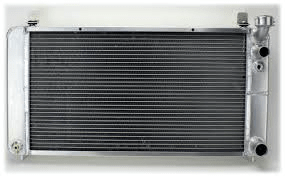 Ryan GMW can quickly restore your radiator or perform maintenance on your cooling system. Last night I noticed that my radiator is leaking. Thank you for pointing out that this can be caused by any damage done to the fins or tubes. It’s so old that I think I should just go ahead and replace it. I’ll have to look into finding the best company to come and replace this for me.